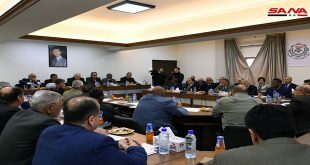 Ambassador of the Democratic People’s Republic of Korea (DPRK) in Damascus, Jang Myong Ho cooperation between the two countries and the exerted efforts to develop coordination between the Union and the Korean Union of farmers in a way that serves the best interests of the two countries. 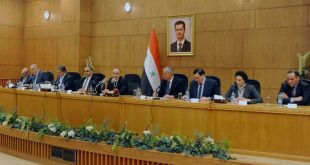 During the meeting, al-Saud pointed out to the achievements which have been gained for the peasants and developments in the agriculture sector due to self-sufficiency policy Syria has witnessed since decades. He affirmed that Syria will overcome the foreign-backed conspiracy thanks to its peoples’ awareness, army’s sacrifices and the wisdom of its leadership. The Korean Ambassador, for his part, affirmed his country’s support to Syria and its people in the face of the conspiracy to which it is exposed, pointing out to the importance of boosting the historic relations between the two countries.